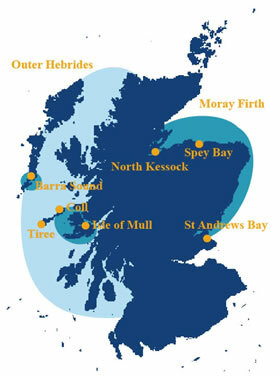 Scotland is at the northern most limit of the bottlenose dolphin global range. The largest resident population in Scotland is found in the north east. This resident population of approximately 190 animals has a range extending from the Moray Firth south along the Aberdeenshire coast to the Tay Estuary and St Andrews Bay. 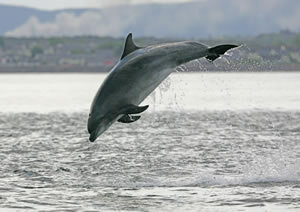 A smaller population of bottlenose dolphins inhabits the waters to the west of Scotland. The population estimate is 45 animals which appear to be split into two communities; one present between the Inner Hebrides and the coastal mainland, and the other, numbering just 13-15 animals, using only the waters around the Sound of Barra. Bottlenose dolphins living in Scottish waters are the largest found anywhere in the world. They are noticeably bigger, chunkier and darker than their counterparts in warmer southerly seas. Bottlenose dolphins appear a uniform dark grey or brownish-grey depending on the light, with paler lower sides and near-white belly. In comparison to other dolphins these animals will appear rather featureless. 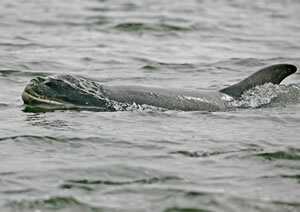 Bottlenose dolphins have a prominent dorsal fin in the middle of the back (centrally placed). The dorsal fin is broader at the base, falcate in shape (curves backwards) with a pointed tip. Tail flukes are pointed and they have longish pointed pectoral fins. Bottlenose dolphins as the name suggests have a distinct beak, relatively short and stubby, which is often white on the lower jaw. The beak is separated from the melon with an obvious crease. Animals are often seen with scratches or rake marks on their body and dorsal fin causes by interaction with other bottlenose dolphins. 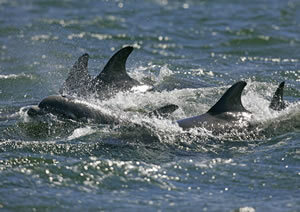 Bottlenose dolphins are regularly seen in groups of 2-12. They are often very surface active and can breach some metres out of the water at which point the white underside will be clearly visible. Bottlenose dolphins commonly interact with boats and are often seen bow riding; other behaviours include tail slapping, lob tailing and spy hoping. The Moray Firth population are known to feed in narrow channels and river mouths, close to shore where groups can be seen hunting, throwing fish and displaying spectacular synchronised breaching behaviours with other members of the group.